NikonD500 + Nikkor 200-500mm. @480mm. f/5.6 , @1/4000 , ISO - 640 . You just raised the bar again, Himadri! What a fantastic image and so unique to get the grebe and dragonfly so beautifully lined up - and reflections too! I love this one. Congratulations! Himadri, love the excellent reflection, red eye, open beak and the way the craning forward head is just brushing the water. The delightful surprise is the hunted dragonfly - what a neat shot! Super shot Himadri! This is top notch to have grebe and dragonfly like this in the frame. What a unique image, Himadri. 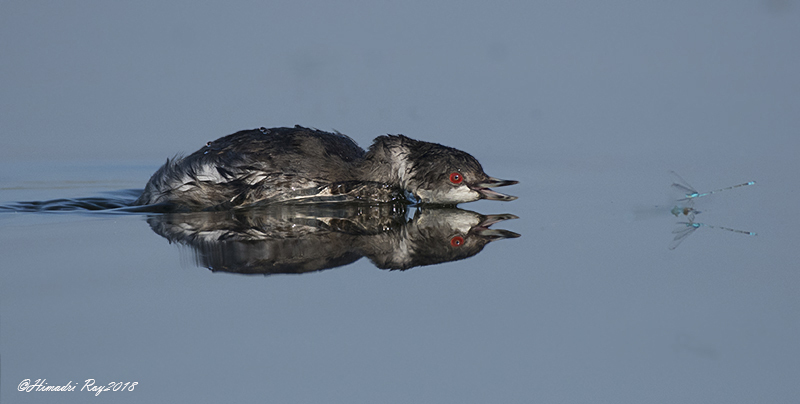 It's one thing to capture the grebe and dragonfly, but to add perfect reflections of both takes this up to the next level. Congrats. Wow- superb shot with the dragonfly bonus and beautiful reflections. Would love to see it even larger! Amazing. Brought a big smile to my face. Love this. Hamadri, A unique image that would take a very long time, if ever, to duplicate. Superb! Super capture Himadri, love the hunting pose and the dragonfly!